Over the past few years, I have consciously been making pilgrimages to the lands of my ancestors. It usually begins with a dream (either sleeping or waking) that compels me to plant my feet on the soils my ancestors once walked and are buried under. Last year, I traveled to Ireland—a beautiful experience that had me feeling the ancient stones and seeing myself as old as time itself. It was my recent journey to Maine that activated some powerful (and, at times, difficult) healing for me. Maine is a land that holds deep ancestral significance for me. It is the land my matrilineal ancestors first stepped foot on in the 1600s coming from the British Isles in search of opportunity and adventure. Over the generations, Maine was a place my ancestors came to love and appreciate as a place of refuge and enjoyment each summer. They built beautiful homes to host grand parties in, they were active in and supported their local communities, and they would bring their children there so that they could continue coming back with appreciation and nostalgia in their hearts. Growing up, I would hear my mom share delightful stories about her times coming to Maine with her mother and grandmother. They would make us laugh until our sides hurt and have us wishing for a time machine so we could go back in time and be there too for those happy times. This side of my family, the ones of Maine, also came with heartache, trauma, hardship, and violence. 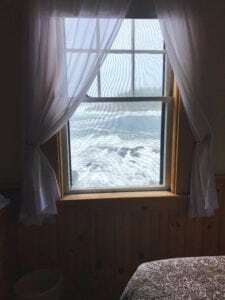 I, myself, hadn’t been to Maine since I was 4 years old because the memories of alcohol abuse and vicious unloving behavior were so painful for my mother. Maine is also a place where my ancestors enslaved people shipped over from Africa and violently forced them to build grand ships they would boast about for many generations. It is a land that belonged to the Abenaki people and was stolen from them by European colonists looking for new resources and bright futures. My ancestors were some of those settlers. My ancestors fought them viciously with their germs and their cannons and their alcohol. They did not ask permission for this land. They simply took it as theirs. Being alive in this time means that we all have a long and tangled past that our ancestors navigated to get us where we are today. To engage in ancestral connection work and try to collect and remember those stories is to ground into a deeper purpose of who you are and why you are alive on this planet today. For those of us living on lands not originally belonging to our ancestors (which is 98% of us), it’s one thing to simply know about places our ancestors first landed upon migrating to their new world. It’s another to physically place your body on that land and courageously (and also responsibly) feel all that comes up from being there. In my own ancestral reconnection journey (much of which I have documented here on my blog over the past few years), I came across some really uncomfortable truths about the people who came before me. I am white. I am descended from European peoples. I live in a culture of white supremacy, where being white makes living life a whole lot easier. The way we got to this place was through the oppression, slavery, and violence against people of color. Despite the well-meaning intentions of my progressive white self, I had some uncomfortable and important work to do around facing the side of my ancestry that was the oppressor. I had to go to Maine to fully feel the impact of my colonizing self. I had to make reparations. Also, I wanted to see the homes my ancestors built. I wanted to learn the proper way to eat a lobster and talk about how the flavor of the meat revealed what kind of weather they had that year. I wanted to talk to the local lobster fisherman and learn about their ways of life. I wanted to smell the flowers and eat the wild berries. I wanted to go to the place where my grandmother’s ashes were scattered and feel her presence in my bones come alive with the crashing of the waves against the rocks. I wanted to walk amongst the gravestones of my ancestors buried in Maine and commit their names to memory. I wanted to bring my mother and aunt (her sister) to soak up every story they shared—knowing I will be the keeper of stories for my descendents to come. I have a lot to share about my ancestral experience in Maine, and I’m going to spend the next few weeks sharing them with you as we dip down towards the thin veil of ancestor season in the northern hemisphere. 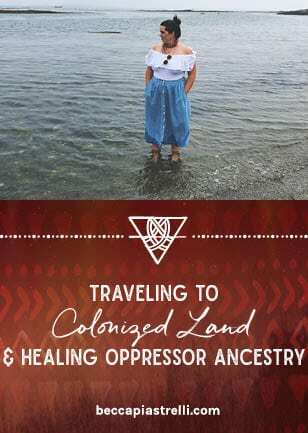 It is my hope that, by sharing my experience, you are inspired to do your own research and take your own pilgrimage to connect more deeply to all aspects of your ancestors. I particularly think it’s important to dig into your near-ancestry (the first settlers in the land you currently inhabit). This will look differently for each one of us because our stories of migration are so unique. I think that’s beautiful and that those stories should be learned and told. So many white women have shared with me that it’s a lot easier for them to skip over their settler ancestral past and go right to the “motherland” - the place where they can trace their indigenous roots and re-connect to the earthways of the people they are descended from. I am all for that—it is something I currently practice and incorporate into my work and pilgrimage plans. But, to completely skip over the stories and people who settled on this land we live on now is to miss a key part of the story. I know that it can feel hard or shameful or confusing or perhaps even emotionally triggering to look at these parts of our ancestral past. But to know our stories and to face the hard truths only shapes us into kinder, generous, more responsible beings. And, in this day and age, we need you to be that. Have you taken an ancestral pilgrimage before? Have you thought about connecting more to the shadow side of your ancestry by visiting the places they once were settler colonizers of? I invite you to share your thoughts, stories, and takeaways in the comments below. I relate to this so much! I am bi-racial, and adopted. Through those two lines, my ancestral lines are so full of both the oppressed and the oppressors, sometimes in very direct and explicit ways. My Paternal grandfather was a slave, carried on a ship literally built in the place and time that my maternal grandfather’s people were. Its an interesting tension. Anyway, as always, I so deeply resonate with your writing and your journey. I always look forward to your posts. Thank you for sharing your story here, Aysha! Wow, what an experience knowing your paternal grandparents and maternal grandparents were in the same place on opposite sides of history. I honor that you are willing to navigate this for your own healing. And thank you for reading! I do wonder what it was about Maine and the NE that called so many people from N Europe over in that time period. My family also came to ME, by way of New Brunswick, from Europe in the 1600s. I’ve never had a calling to visit Europe, but I’ve been feeling called back to that land of the North East, I’m feeling cravings of seasons and ancestral familiarity of plants. Despite being a 2nd generation Californian, this area no longer feels like home (particularly with climate change) and have plans to relocate in the Spring. Oh wow, that’s exciting Melissa! I do have the say the plants felt really good when I was there. And also – the craggy rocks and thick fog? Totally familiar to our original ancestral lands!